Temporarily Unavailable. Contact customer service for a status update. 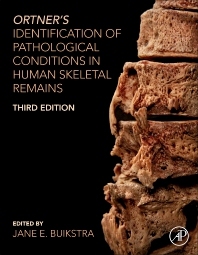 Ortner's Identification of Pathological Conditions in Human Skeletal Remains, Third Edition, provides an integrated and comprehensive treatment of the pathological conditions that affect the human skeleton. As ancient skeletal remains can reveal a treasure trove of information to the modern orthopedist, pathologist, forensic anthropologist, and radiologist, this book presents a timely resource. Beautifully illustrated with over 1,100 photographs and drawings, it provides an essential text and material on bone pathology, thus helping improve the diagnostic ability of those interested in human dry bone pathology. Jane Buikstra heads the Center for Bioarchaeology at Arizona State University and is a member of the National Academy of Science. Her work in the Lower Illinois River Valley fostered the development of Bioarchaeology and she continues to be the leading scholar in this field.